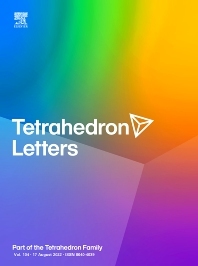 Tetrahedron Letters provides rapid dissemination of short accounts of advances of outstanding significance and timeliness in the broad field of organic chemistry and its related disciplines, such as organic materials and bio-organic chemistry. Communications in Tetrahedron Letters are expected to represent brief summaries of preliminary work or initial results at the cutting edge of the field. Rapid publication of such research enables authors to transmit their new contributions quickly to a large, international audience. Tetrahedron Letters also publishes 'Digests', commissioned short reviews, highlights or perspectives, focusing on recent advancements in a field.